In our boat briefings, we joke about drift diving as “lazy man diving.” Under water, we move along with the flow of the ocean. We explain to out-of-towners that when they come up from a dive, they should stay put, and wait for “curbside pickup.” When we surface, we deploy our surface marker buoys and the captain brings the boat right over to us. South Florida divers know we are spoiled, but how much do we know about the elements that converge to create this unique form of scuba diving? The most widely known factor that contributes to drift diving as the standard for east coast Floridians is the flow of the Gulf Stream. Trade Winds, blowing from Africa, carry equatorial Atlantic waters westward. This flow moves past the Antilles and Caribbean, and through the Yucatan Channel. Then, the water channel narrows, and the flow gains strength as it loops into the Gulf of Mexico. As water runs into the gulf, it takes on a clockwise rotation, or “Tropical Gyre.” Water then flows around the tip of Florida and up the east coast. 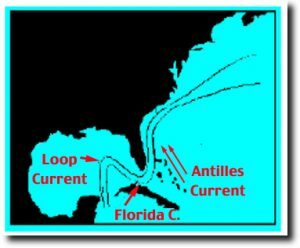 This specific segment of the Gulf Stream, known as the “Florida Current,” moves relatively parallel to the coast from the Florida Straits up to Cape Hatteras, North Carolina. Because of the Earth’s rotation, this current is constrained to a narrow segment on its western boundary. Although general diving in South Florida is not directly within the Gulf Stream, the overall flow of water northward directs near-shore currents. 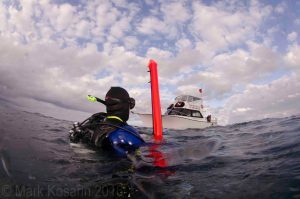 With the exception of occasional crosscurrents, standard drift diving in South Florida carries divers from South to North. Prepared divers anticipate these conditions, and carry a compass to help them navigate the reef. From the surface, dive boats monitor our progress along the reef by watching our float ball. An underwater dive guide carries a reel attached to the float, which follows divers as we move with the current. The clear, warm water flowing offshore also plays a huge role in the health of South Florida’s unique coral reef system. Florida is the only state in the continental US that features extensive coral reef formations in near-coastal shallow waters. Image courtesy Force-E Instructor Mark Kosarin. The Florida Reef Tract (FRT) runs approximately 360 miles along Florida’s coast, from the Keys up past the St. Lucie Inlet. It is also one of the largest reef systems in the world. 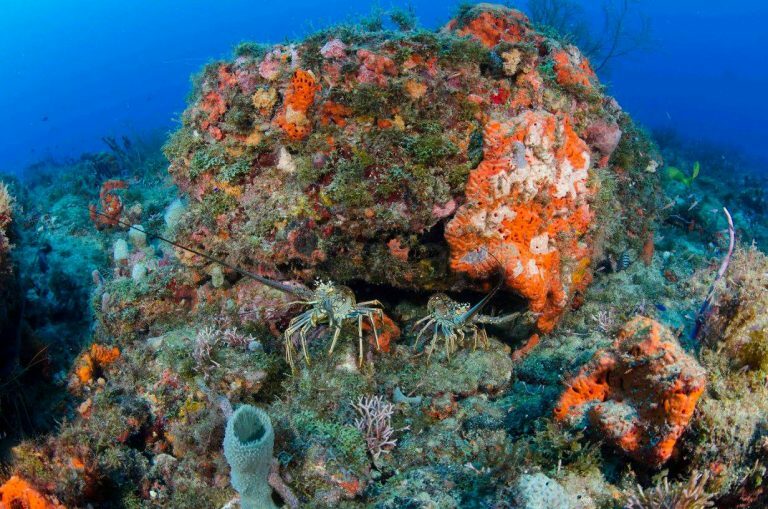 The FRT is also home to more than 80% of all coral species found in tropical western Atlantic waters. The northern extension of the FRT is a somewhat discontinuous reef line. It features between 1-3 terraces and numerous smaller “patch” reefs. Most of these ledges are shore facing, with the ledge to the diver's right as they drift northward. The Gulf Stream current feeds these reef systems with warm, healthy blue waters. It helps provide an environment in which a coral reef system thrives. The constant in-flow of warm waters also keeps temperatures relatively comfortable for sport divers year round. Drift diving allows us to observe a large section of reef with minimal effort. In many ways, drift diving enhances the magic of being underwater. Because we go with the flow, we can take advantage of our weightlessness to hover over the corals and sponge. We can drift upside down parallel to reef, scouting under ledges for lobster. Because drift diving is such a unique form of experiencing the sport, PADI offers a specific Drift Diving specialty. While drift diving can seem intimidating at first, mastering some unique skills will greatly enhance your experience. Learning how to make a negative entry will help ensure you are able to stay with the guide when descending. In swift currents, proper techniques will help you navigate a wreck, without exhausting yourself swimming against the water’s flow. A Drift Diving Specialty class fine tunes these skills, and can be completed with our Force-E instructors. You can also adapt specific skill sets to local conditions through Boat Diver or Peak Performance Buoyancy specialties. When the current is moving, having acute control over the buoyancy will greatly enhance your experience. We love drift diving! Force-E staff are here to ensure you are having the best underwater experience possible. Let us share our passion and knowledge as we work together to perfect your skills. We’ll see you under water!